Barnsdales and Regional Property Auctioneers (RPA) are delighted to have put forward a team to compete in a charity 5 a side football (DB4C) competition held at the Doncaster Dome. The team was made up of members of the Sheffield and Doncaster offices of Barnsdales and RPA. The team faced stiff competition and sadly didn't win, but were delighted to be able support a charitable event and to play in the spirit of such. 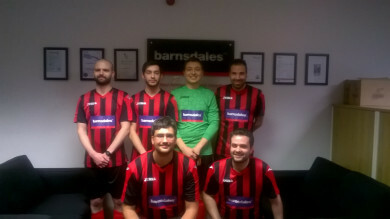 The Barnsdales & RPA team sported their new football kit and so are now looking forward to another opportunity to play!